As soon as the temperatures outside start dropping, the coziness factor inside starts rising. More cups of tea are consumed, the big blankets get pulled out of storage, flannel pajamas start to make their appearance and soups are eaten at least three nights a week (if not four or five....). Basically, we go into full on hibernation mode here at the Runway Chef household. One of the first places that starts to get cozy-ified is always the bedroom. It's the place I often feel the coldest, so I try to make it warm and inviting as soon as it's socially acceptable. I usually start this process by buying a new set of sheets and switching out throw blankets/coverlets and/or decorative pillows. Both are such easy ways to refresh and update a room while also transitioning it into the new season. Right before I started making this year's seasonal switches I just so happened to receive the fall Annie Selke catalog (Pssst! You can get 15% off your first order AND your own catalog here.). For those of you who don't know, Annie Selke, a home decor brand whose high-quality products exude comfort, happiness and style, is actually headquartered in the same place that I'm from, Pittsfield, Massachusetts (What are the odds, right?!). I grew up driving past their stores and with their products decorating not only our home, but also the homes of friends and family. In fact, we even had an old family friend (who we have, sadly, long since lost touch with) who at one point worked for the brand and I remember, as a child, being enamored by the pretty prints and patterns she would show me and the stories and details of her job (not to mention, I would beg my Mom to stop and and visit her and the store just about every time we drove by). It was also this woman who just so happened to introduce me to one of my best childhood friends. Suffice to say, I have a big soft spot for all things Annie Selke, so naturally, when I received the fall catalog I couldn't help but be inspired by it (particularly the serene bedroom featured on page 8) as I turned our bedroom into a warm and comforting oasis. 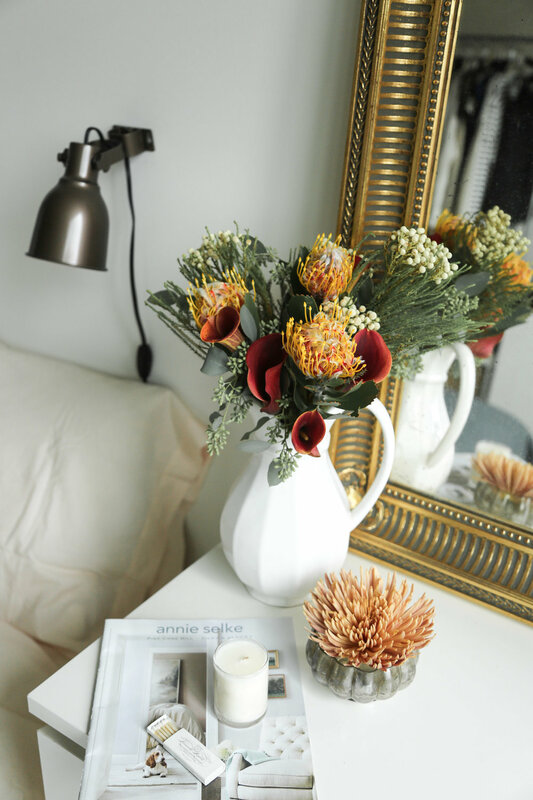 I'm sharing all 6 cozy bedroom updates for fall below so you too can create your own intimate space this season. And, to help you make those updates, there's a chance to win some Annie Selke gift cards at the bottom of this post! Also, I'd love to know, do you make decorating changes for the season? If so, what do you chance? Cozy Blankets || This probably goes without saying, but the colder the temperatures get, the more blankets I like to pile on. We just added this one to our collection and I love how the texture adds another dimension to the decor of our room, not to mention it's super cozy and warm. Cover Colors || I'm a white duvet girl all the way. However, in the fall, white can feel, well, a little cold. Since our bedroom is New York sized (aka small), I don't like to ever fully switch to a dark duvet cover. However, with this slate colored coverlet I don't have to. I can easily switch between a light and dark bed without having to give up space or my favorite duvet cover color. During the day the coverlet gets folded at the end of the bed during, which also provides a nice contrast and decorative feel to the overall space. New Sheets || As I mentioned up above, I like to switch up my sheets with the changing seasons. While summer is all about crisp, clean linens, fall and winter are all about coziness and warmth. I mean, let's be real. Crisp, cool sheets are nice and all when it's 80-something degrees out, but when the temps dip down low, they start to feel anything but. I invested in some blush pink sheets a while ago, but luckily, Annie Selkie has some almost-identical ones available now. Flannel sheets are also another favorite of mine this time of year. Layered Rugs || Layering rugs is nothing new. However, there's something about the thought of my feet hitting a cold floor every morning that really inspires me layer my rugs even more/add extra rug layers. My favorite is a soft and fuzzy faux sheepskin rug, but I also love this one. Candles || Lighting a candle is one of the easiest ways to instantly switch the mood of a room. These particular candles from Annie Selke have an incredible fragrance that fills the room with a beautiful scent even when they aren't lit. Decorative Pillows || Another thing I mentioned above was decorative pillows being one of the simplest seasonal bedroom shifts to make. While you could definitely go for something darker per the season, I instead opted for this neutral patterned pillow to keep our bedroom feeling serene.